Phragmites that clog waterways in the Saginaw Valley have been identified as European invaders. Purple loosestrife are not attractive garden plants, as they appear, but are invasive species. Michigan is starting to fight back against foreign invaders. No, not terrorists -- flora and fauna, animals, fish and plants. Officially they are called Aquatic Invasive Species (AIS). In the past 25 years an estimated 50,000 foreign invaders have landed on our shores, according to biologists. About 5,000 of this total are plants like phragmites and purple loosestrife that are prevalent in the Saginaw Valley. The Saginaw Basin Land Conservancy has received a $21,888 grant from the Saginaw Bay Watershed Initiative (WIN) for a land restoration and demonstration project at the Pinconning Nature Preserve. Funding will be used to eliminate the invasive phragmites vegetation that has taken hold at a high quality coastal site along the Saginaw Bay. This project will involve a controlled burn on the property as well as the application of a chemical herbicide and will serve as a demonstration project for other sites where phragmites are a problem. 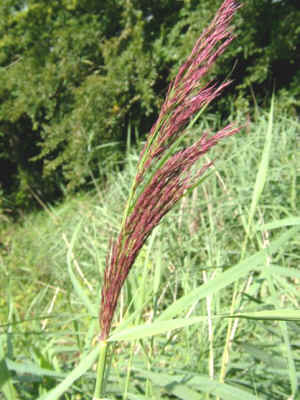 A Yale University biologist, Kristin Saltonstall, has identified the phragmites as European invaders, almost indistinguishable from the domestic variety of phragmites. Phragmites spread through the root system and crowd out most other native plants, mainly along waterways, creeks and ditches. Aquatic invasive species (AIS) are plants, animals and microscopic organisms that have caused serious problems in aquatic ecosystems outside of their native range. These species threaten the biodiversity and function of the Great Lakes ecosystem. Michigan Sea Grant, administered through the University of Michigan, Ann Arbor, supports research, outreach and education to prevent new introductions of AIS into the Great Lakes and control the spread of established AIS populations. The Saginaw River basin contains the largest remaining coastal wetlands in the United States. Coastal wetlands are among the most biologically diverse and productive ecosystems in the Great Lakes. Provide breeding, nesting, and feeding habitat for a diversity of native and migrating waterfowl, songbirds, amphibians, reptiles, and mammals. Provide critical fish habitat for many species. Approximately 90 percent of the 200 fish species living in the Great Lakes that rely on coastal wetlands during some part of their life cycle. Provide nursery areas for larval stages of important sport fish, including yellow perch, smallmouth bass, and largemouth bass.n Support invertebrate communities, including insects, snails, and other small organisms. Fish depend on these organisms for food and nutrient cycling. Reduce erosion and sediment suspension by absorbing wave action along the shoreline. The Saginaw Bay Watershed Initiative Network (WIN)is a volunteer organization linking economic, social, and environmental aspects of Saginaw Bay communities to sustain and improve quality of life. The organization makes grants twice a year, spring and fall. "These projects were developed and designed to promote the concept of sustainability - the relationship of the economy, the environment, and our communities", said Michael Kelly of The Conservation Fund, the organization that administers WIN. "From a project designed to plan for a non-motorized trail network across the region, to a program that will identify and design conservation options for high priority farmland areas in Bay County - these projects represent efforts that help to improve our environment, while at the same time strengthen our economy and our communities", said Kelly. Other projects receiving funding in this round include a project to identify important types of wetland habitats for migrating waterfowl, the development of a native plant seed source for the Shiawassee Refuge in cooperation with the Saginaw Correctional Facility, an expansion of a family gardening program, a conference focusing on "clean" energy, and a land use analysis for Shiawassee, Lapeer, and Genesee Counties. Eleven area foundations and corporations network to support WIN projects, including: Bay Area Community Foundation, Charles J. Strosacker Foundation, Consumers Energy Foundation, Harry A. and Margaret D. Towsley Foundation, Midland Area Community Foundation, Rollin M. Gerstacker Foundation, Saginaw Community Foundation, The Dow Chemical Company Foundation, The Herbert H. and Grace A. Dow Foundation, S.C. Johnson Fund, and the Cook Family Foundation. These foundations and corporations contribute $300,000 per year to the Sustainable Communities Initiative Fund at the Bay Area Community Foundation to support WIN projects. WIN and partners to date have provided more than $2 million to support projects positioning the Saginaw Bay Watershed as a sustainable community. Priority is given to projects that are innovative, cross governmental boundaries, and attempt to balance the environment, economy, and the community. WIN grants have been matched by more than $6 million in other funding. More information about WIN, is available on its website at www.saginawbaywin.org. The Conservation Fund, the only national environmental organization to receive an A+ rating from the American Institute of Philanthropy, acts to protect the nation's legacy of land and water resources in partnership with other organizations, public agencies, foundations, corporations, and individuals.